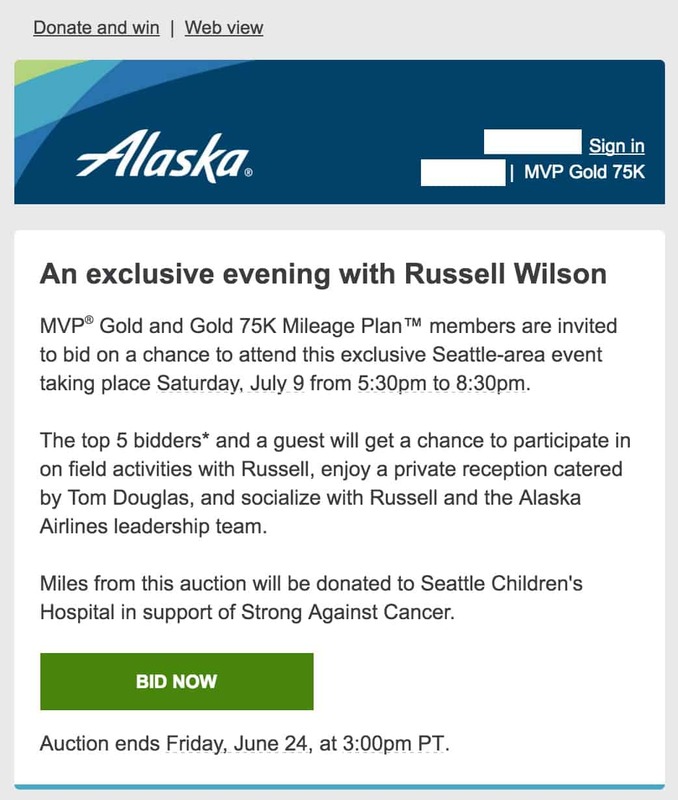 I received an email today inviting me to bid on the Alaska Airlines Russell Wilson Auction. In order to participate, you must be a current Mileage Plan Gold or Gold 75K member. You can “bid” with your miles for an evening with Seattle Seahawks Quarterback Russell Wilson, aka Alaska’s Chief Football Officer, on July 9th. It sounds like besides getting some tips on playing football from Russell, you also get a catered dinner from Tom Douglas (who designed the inflight menu for Alaska flights). The top 5 bidders of the Alaska Airlines Russell Wilson Auction will win two tickets to the event. All the miles will be donated to Seattle Children’s Hospital. I’m not exactly sure what this means. Maybe the miles will be used to fly patients and their families in for treatment. Or maybe Alaska will donate a dollar amount for each mile. It isn’t clear form the website. If you are interested in bidding (and promise I will be your plus one), you can do so here. Right now in order to be in the top 5 bids you need to bid at least 225,000 miles. Bidding closes at 3:00pm on Friday June 24. The full Q&A on the Alaska Airlines Russell Wilson Auction is available here. MVP® Gold and Gold 75K Mileage Plan™ members are invited to bid on a chance to attend this exclusive event taking place in Seattle, on July 9, 2016, from 5:30pm to 8:30pm. We’re donating all the miles from the winning bids in this auction to Seattle Children’s Hospital, in support of Strong Against Cancer. Russell Wilson Passing Academy is a children’s football camp focused on the sport, working as a team, and teaching physical and mental development. Alaska Airlines is a proud sponsor and excited to host an small private evening event with Russell modeled after this passing academy. The top 5 bidders* and a guest will get to participate in on field activities with Russell, enjoy a private reception catered by Tom Douglas, and socialize with Russell and the Alaska Airlines leadership team. The event program is designed for adults. We encourage guests to be at least 16 years old. Don’t wait! Auction ends Friday, June 24, at 3:00 pm. (PT). *Only bids from current MVP® Gold and Gold 75K Mileage Plan™ members are eligible to win.